Narendra Modi in Kashmir HIGHLIGHT: Security forces have been put on high alert and more than 25 CRPF companies along with the J-k police and the SPG from adjoining districts have been moved to Srinagar ahead of Modi's visit. Prime Minister Narendra Modi on Saturday inaugurated the 330-MW Kishanganga hydroelectric power project and laid foundation stone for the semi-ring road project, in Srinagar. “This project will not only give free but enough electricity to the people of Jammu and Kashmir. Presently, the amount of electricity the state needs, most part of it is given by others states. This 330-MW project will be helpful in reducing the problem of electricity to a large extent,” PM Modi said. Earlier in the day, PM Modi unveiled the plaque to commence work for Zojila tunnel to provide all-weather connectivity between Srinagar, Kargil and Leh. “Jammu and Kashmir is going to get development projects worth Rs. 25,000 crore. These projects will have a positive impact on the people of the state,” Modi said after inaugurating the project. The 14-km-long Zojila tunnel will be India’s longest road tunnel and Asia’s longest bi-directional tunnel. Later in the day, PM Modi will also inaugurate the 330-MW Kishanganga hydroelectric power project and lay foundation stone for the semi-ring road project, in Srinagar. The Prime Minister also attended the closing ceremony of the Birth Centenary celebration of the 19th Kushok Bakula Rinpoche in Leh, where he praised Bakula for his developmental works in India. Chief Minister Mehbooba Mufti and Union Minister Nitin Gadkari were also present at the ceremony. "Today is a memorable day. I got the opportunity to inaugrate many develeopment projects. Two of them are dedicated to Maa Vaishno Devi. Kashmir will gradually become the rising star of 'New India," said PM Modi. Jammu and Kashmir Chief Minister Mehbooba Mufti thanked PM Modi for launching a number of development activities in the state. The Prime Minister inagurated the Tarakot Marg in Vaishno Devi as well as a material ropeway which will enable 5000 kgs of goods per hour to the shrine. "Our government doesn't want the farmer to be dependent on just one crop. It is working to encourage all ways through which the income of farmers can be increased additionally," said the Prime Minister in his address to students. Last year, due to the consistent efforts of farmers, agrarian scientists and the policies of the government, we were able to break all records of production in terms of wheat, rice and pulses," PM Modi was quoted as saying. 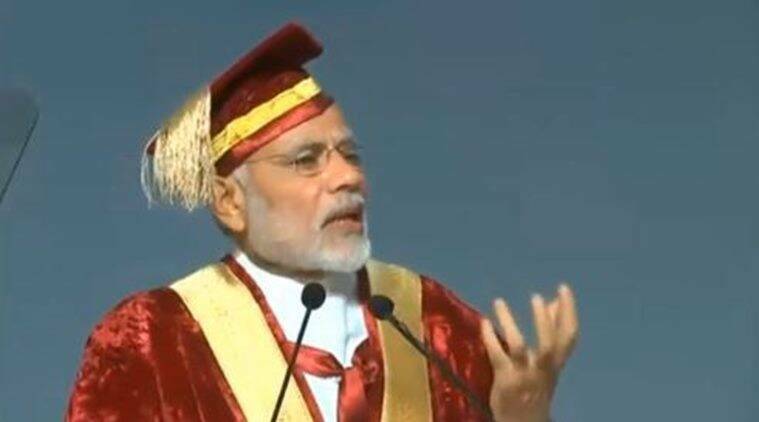 Prime Minister Narendra Modi while addressing the students at Sher-e-Kashmir University , mentioned union budget allocation for dairy farmers, animal husbandaries and fisheries. Meanwhile, four militants have been killed so far in the encounter with security forces in Handwara area of Kupwara district, which started on Friday. Operation underway. 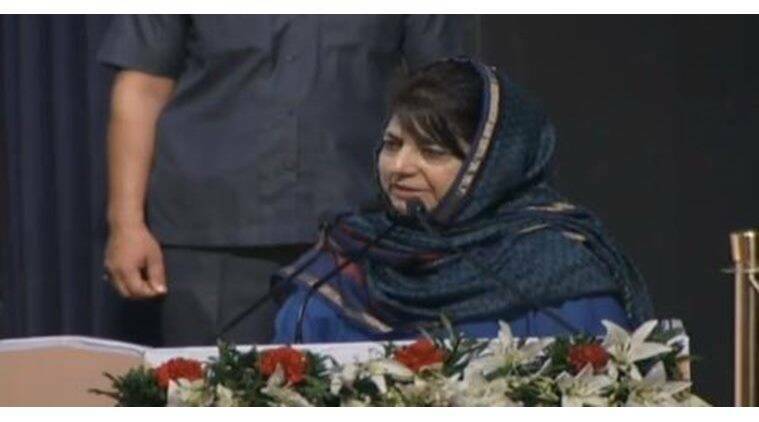 J-K Chief Minister Mehbooba Mufti said, "I am thankful to PM Modi that he thought about us and announced a unilateral ceasefire in Kashmir during Ramzan. We expected that we will get the same response from Pak but unfortunately, we didn't get it." Taking about Jammu and Kashmir's tourism sector, PM Modi said, "Our govt is working for the ecosystem that is required for the development of tourism. There will be an increase in tourists in J&K with a stronger ecosystem. The youths of the state will get new employment opportunity with it." "There is no substitute for peace and stability. I urge the youth who have lost their way to return to the mainstream. The mainstream is their parents and family. The mainstream is their contribution to the development of Jammu and Kashmir. The responsibility of taking forward the development process and increasing the pride and honour of Jammu and Kashmir lies on this young generation. The state has so much of resources that there is no question that Jammu and Kashmir can stay behind other states," says PM Modi. "Today, many youths of Jammu and Kashmir are becoming role models for the youth in other parts of the country. 125 crore people of the country are working on the New India project and Jammu and Kashmir can become the shining star of this New India," says PM Modi. PM Modi says, "There are various rives in the Valley which can serve as a great source of hydroelectricity. This is that part of the country which can produce electricity not only for the state but for the other parts of the country as well. And keeping this in mind, we have been working on various projects since last four years." PM Modi also laid foundation for the Srinagar's Ring road project. "From this stage, iIgot the opportunity to inaugurate the Srinagar Ring Road. Around 1200 crores will be spend on the construction of this 42 kilometer long raod. This road will solve the problem of traffic jam in the city and will somewhat make your lives easy. " "This project will not only give free but enough electricity to the people of Jammu and Kashmir. Presently, the amount of electricity the state needs, most part of it is given by others parts of the country. This 330 MW project will be helpful in reducing the problem of electricity to a large extent," PM Modi said. "This is also a good coincident that we all have come together here during the holy month of Ramzaan. Today, I feel blessed to dedicate the Kishanganga Hydropower project to the nation. This project is ready to add to the developments of Jammu and Kashmir. 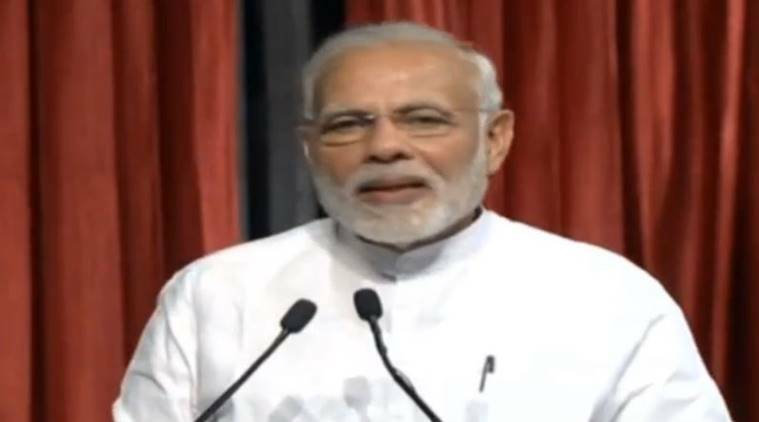 I congratulate all of you on this occasion," PM Modi says. "After the floods in Jammu and Kashmir, I celebrated Diwali with the victims here. Besides this, I even got the opportunity to celebrate the festival of lights with the soldiers. And now, when the pious month of Ramzan is going on, I am amidst you people," PM Modi. PM Modi says, "Once again I have got the opportunity to come here and it is because of your love and affection. There has not been a single year in the last four years when I did not visit Srinagar." PM inaugurated Kishanganga hydroelectric power project in Srinagar. PM Modi to dedicate the 330-MW Kishanganga hydroelectric power project to the nation at SKICC, Srinagar, soon. PM Narendra Modi arrives in Srinagar, his first visit after announcing suspension of anti-militancy operations during holy month of Ramzan. "People want a medical college here. I have taken the demand seriously and I will ask the state and the central government to explore this possibility and furnish a report on setting up a medical college," the Prime Minister said. PM Modi said, "There is no better place for solar energy development in the county than the Ladakh region. Aromatic industry is developing fast in the world. There is a shift from chemical aroma to natural aroma. This industry has a great potential here. "He promised to make a state of the art cultural centre and a digital museum for the region. "Zojila is not just an infrastructure project. It is going to be technological marvel." He said he had asked Road, Transport and Highways Minister Nitin Gadkari to ensure that the project was completed in record time. The tunnel will give the region round the year connectivity with the rest of the country. Modi said Ladakh was an example of "great legacy of brotherhood and peace" and connecting people of the country with each other was Kushak Bakula's special attribute also known in far-off Mangolia. the Prime Minister said, "The region is not new to me. I have come here many times. When I worked for the party and visited Ladakh, my friends would ask me to bring some vegetables for them from Ladakh for the taste and purity of the local produce." "With a population of just a lakh and a quarter, the people of Ladakh host two lakh tourists each year." The Prime Minister started his speech in Ladakhi language as the gathering exploded with applause. 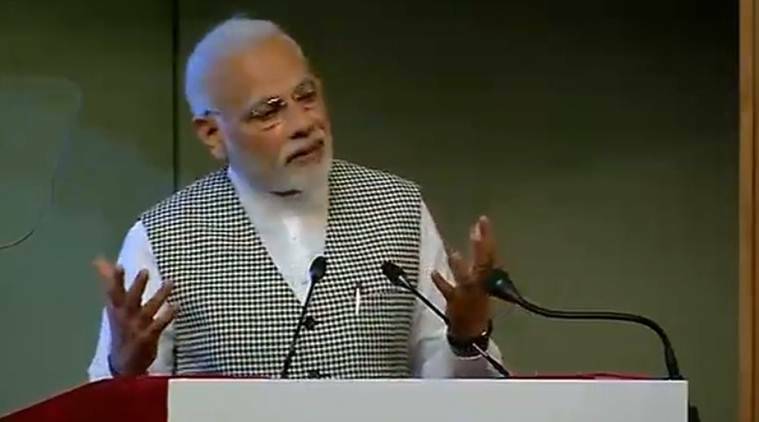 PM Modi said Ladakh today was a far cry from its past when it was known just for three things "totu" (pony) "sottu" (powdered corn) and "patu" (local tweed). "Your self-confidence has taken Ladakh to great heights from those days of backwardness. I am told today that the entrepreneurship of the women of Ladakh is an example for the rest of the country. PM Modi said on Saturday the people of Ladakh have set an example in human endeavour and urge for progress that must be followed by those living in Jammu and Kashmir regions. "Despite hardships and inaccessibility, Ladakhis have set up an example in endeavouring hardships and yet continuing their march of progress and development. This example will have to be followed by the people of the valley and the Jammu region," he said. Ring Roads in Srinagar and Jammu are aimed at reducing traffic congestion and making road travel safer, faster, more convenient and more environment friendly. PM will also attend the Convocation of the Sher-e-Kashmir University of Agricultural Sciences & Technology, Jammu. He is also set to lay the Foundation Stone of the Pakul Dul Power Project, and the Jammu Ring Road. He will also inaugurate the Tarakote Marg and Material Ropeway of the Shri Mata Vaishno Devi Shrine Board. The Tarakote Marg will facilitate pilgrims visiting the shrine. PM would lay the Foundation Stone of the Pakul Dul Power Project, and the Jammu Ring Road. He will also inaugurate the Tarakote Marg and Material Ropeway of the Shri Mata Vaishno Devi Shrine Board. The Tarakote Marg will facilitate pilgrims visiting the shrine. PM Modi will dedicate the 330 MW Kishanganga Hydropower Station to the Nation, at the Sher-i-Kashmir International Conference Centre (SKICC) in Srinagar. He will also lay the Foundation Stone of the Srinagar Ring Road. PM Modi also said, "Four crore houses which do not have electricity even after 70 years of Independence will be given connection within a year and a half." "There is great scope for agricultural growth across the state of Jammu and Kashmir. This state can play a key role when it comes to helping further holistic healthcare," says PM Narendra Modi. PM Modi says, The tunnel will make the life of Leh people easy. You can imagine how fast the development work will become then. the education system will also improve and children will get many opportunities to learn and become successful. Narendra Modi in Kashmir LIVE:Later today, PM Modi will also will also inaugurate the Tarakote Marg and material ropeway of the Vaishno Devi Shrine Board. The Tarakote Marg will facilitate pilgrims visiting the shrine. Besides, he is also expected to attend the Convocation of the Sher-e-Kashmir University of Agricultural Sciences & Technology, Jammu. Security forces have been put on high alert and more than 25 CRPF companies along with the J-k police and the SPG from adjoining districts have been moved to Srinagar ahead of Modi's visit. However, two days after Modi government announced a ceasefire against militants to provide for a peaceful environment during the holy month of Ramzan, the separatist leadership in the Valley has called for a march to Lal Chowk to protest against Modi’s visit and also announced a shutdown on Saturday. The mainstream parties in Kashmir are hopeful that Modi’s visit will see more steps towards peace.